Internet based business owners spend countless hours putting together information products for consumers all over the world. These good range from E-books, and reports, to software and services. They are often required to produce a large amount of information and services in a short amount of time. A major hitch in this system arises when the business owner buys into the concept that all products and services must be perfect before released or before another service or product can be started. If one would take a look at some of the most successful businesses in the world today, they would quickly see that this is not the way that they do business. Successful, money making businesses release their products before they are “perfect,” because they know that the product will progress along the line towards perfection at a much quicker pace if consumers are involved in the process. Think of it this way, how many minds are better at perfecting a product, one or two, or one or two hundred? 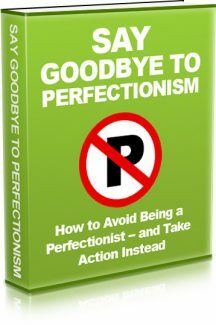 By overcoming this concept of perfectionism, internet based business owners can actually increase their profits and decrease their time commitment, while at the same time producing a better product. The temptation for many internet based business owners is to try to get everything right on the first try. This simply defies logic for many reasons. The first of which is that it totally negates the major underlying learning theories. That is, people learn from repetition and from making mistakes. It’s called the law of approximations. Products improve as the approach, or approximate perfection. Just as one rewards children for even the approximations of good behavior, so does the consumer reward the business owner when they approximate correctly. Consumers are forgiving and want to be involved in the producing of a product that they will enjoy. It’s call buy-in. Consumers buy-in to a product when they are allowed to provide feedback. When consumers feel apart of the process, that translates into profit for the business owner! That brings up the next reason; perfection is in the eye of the beholder. This will be examined more in detail in the preceding paragraphs, suffice it to say here that a producer can not know what a perfect product is until she has received feedback from the consumer. The goal is this: to release products in a timely manner as to receive constant feedback from consumers. This will allow for the producer to then get a better picture of what the consumer thinks is perfect, and to adjust accordingly. If product hit the mainstream only seldom, there is little feedback that can then be put back into the production system. It is the old theory of priming the pump. One used to have to put a little water in the well pump to get it to pump out water in return. The same principle works in the internet based information product world. It is ideal to release a product, get some feedback, rework the product and release again. Or even learn from the feedback received from one product to aid in the production of another product. Literally, the more perfect an internet based business owner tries to be with an initial product, the more likely it is not to be a perfect product. The following paragraphs will serve to illuminate some of the common perfectionists traps that internet based business owners typically fall prey to. It is not always easy to recognize them, especially in oneself. But the following paragraphs seek to help one look inside himself to find the traps that maybe hindering success. They will also seek to give some alternatives and ways to deal with the perfectionist’s traps. The common traps that will be examined are: When being a perfectionist is bad; perfection is in the eye of the consumer; Momentum: The success maker; The quicksand of perfectionism; and A Win/Win situation. If one wants their internet business to thrive, he must avoid these traps at all cost. By avoiding them, the internet based business owner will not only become a better person, but also the owner of a more successful business! Often times being a perfectionist is thought about in positive terms. They do things right the first time and do not have to do them again. This might be a good mantra for carpenters (measure twice, cut once) and mechanics (who wants a mechanic who truly works solely on trial and error? ), but it is not a great way to run an internet based business. There are four key ways in which being a perfectionist can prevent an internet based business owner from becoming successful: too much time is spent in planning and not action, little or no feedback is received from the consumers, success is not allowed to build upon success and perfection can be a relative term. Planning is important. It is foolish to set out to build a home or a business or even a product without a plan. The problem arises when the plan becomes the purpose. The plan is not the purpose, the product, or the home or the business is the purpose. It is very much like the old adage that one can not see the forest because of the trees.